I love the group of runners that you are a part of, and wondering if you have any tips for how to meet other runners in your area? Are these women who you have always known, or did you join a running club? Do you run together a lot during the week or just race together? First-ever blogger meet-up with Zoë in 2009. GREAT question! It has taken a couple of years to meet all the great women that I get to run with. I met them all through blogging. Zoë (Run, Zoë, Run) was the first blogger I met up with in 2009. We discovered that we only lived about 10-15 minutes away from each other. We were both training for our first half marathon, so we met up for 11 miles. Me and Mel during one of our lunch runs in March. Then, Mel (Tall Mom on the Run) and I discovered we only worked about a mile from each other. I ran with her once, but she was so speedy and training for Boston, I was too scared to run with her after that. Silly. She didn’t mind, so I shouldn’t have. Anyway, we’ve been meeting for lunch runs pretty much this entire year, and it’s been great. Me and Alma at the North Olympic Discovery Half Marathon in 2010. I met Alma (Average Woman’s Running Blog) when I posted that I was not going to be able to run my first full in 2010 and was going to walk the half. She was recovering from an injury and was going to walk it, too. I met her the morning of the race and we had a blast! I met other bloggers, like Chelsea (Will Run for Food), Amanda (5 Miles Past Empty), and Jill (Running to Sanity) through these bloggers or at blogger meet-ups before races. And the group just kept on growing. With so many people, it was getting hard to coordinate schedules. I decided to make an official running group: Women Runners of King County (WeROKC). I posted a shout-out on my blog, then I started a Facebook group so we can all easily stay in touch, post our runs and possibly meet up to run with each other. The idea was for the group to meet regularly, but it’s worked better as a way to simply post and meet-up whenever. Check out your local running specialty store. They often have group runs. You may meet someone else looking for a running buddy. You can always split off from that main group later. Look for running bloggers in your area. 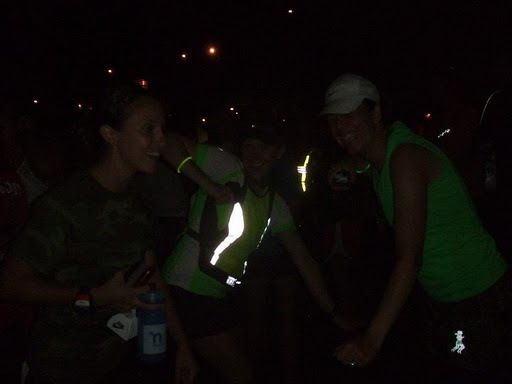 Most bloggers I know love to meet new running buddies. The more the merrier! Look on Meetup.com. Some running groups post information about their weekly runs there. Contact the race organizers of your local races. They probably will know of local running groups (they are probably in one!). DOING HOOD TO COAST AGAIN? Have you thought of doing HTC again with another group of Bloggers without Nuun sponsoring the team and just splitting the cost? I’d do HTC again in a heartbeat, but I have no idea what the costs are. I don’t know if I could get the hubs on board if the cost was too high, which is why I am so grateful to Nuun for helping me get that experience. thought old-school dance moves were appropriate. Here, we demonstrate the lawnmower. And, I’m sorry I can’t remember who or when, but someone recently asked me about my long runs and whether or not I was still doing the run-walk method for them. A: I used the run-walk-run method for full marathon training in order to prevent injuries, but I did not use it for my sub-2 half training. My PT told me, when I went in to get my shin checked during full training, that I probably would not have been in to see him had I been training for a half. For me, the extra mileage (extra pounding the pavement) is what starts to irritate my calves and shins, so the run-walk-run helps reduce the impact. I seem to be fine during half training, so I am comfortable running the entire time. I loved it for the full, though. Not only did it help keep me from getting injured, it was also a great way to break up the mileage. For more information on Jeff Galloway’s run-walk-run marathon training method, go HERE.